1953. Mixed development of 58 apartments and 14 retail shops. A beautifully conserved slice of Singapore’s heritage at a city fringe location. 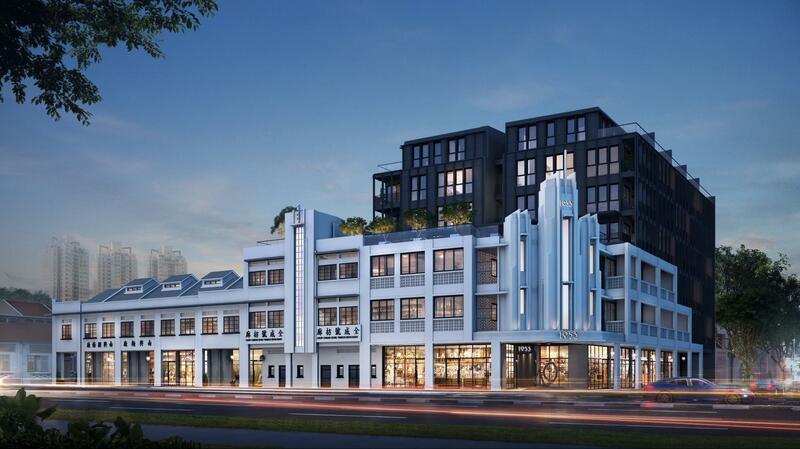 Modernised yet keeping its Art Deco architectural legacy, fusing the old and the new. This 1953 condo is a lovely freehold property, to appreciate for generations. The 1953 Tessensohn development is located in Balestier, a subzone of the Novena planning area in the Central Region of Singapore. It fronts Balestier Road and is bounded on two sides by Tessensohn Road and Race Course Road. About 6 minutes walk to Farrer MRT station, that is two stops from Doby Ghaut in Orchard Road. If you are looking for something other than the typical run-of-the-mill condominium, something unique with character, then this 1953 condo could be for you. It is a new 6 storey high residential project with shops at the ground level, that merges with 7 conservation shophouses dating from 1953. 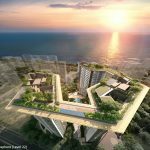 Being developed by Oxley Amethyst Pte Ltd, a unit of Oxley Holdings. 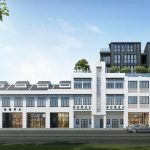 This project continues the tradition of the archetypal Singapore shophouse, with its commercial shops at ground floor, and living spaces above that. The ground level is set back from the road, with an overhanging verandah along the front supported by columns, that creates the distinctive five-footway design. 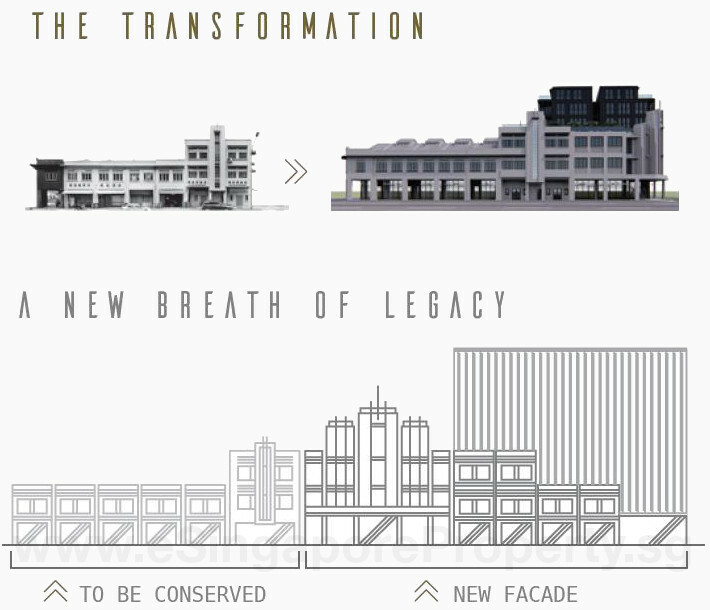 The 7 conservation shophouses at 1953 @ Tessensohn exemplifies the Art Deco architectural style. These have been merged so cleverly into the 1953 mixed development, that the new part continues almost seamlessly from the old. It does so by picking up on and encapsulating the Art Deco motifs of the shophouses, such as streamlined design, and strong horizontal and vertical lines. The curved corner is another typical Art Deco element. 7 of the shops and 9 of the residential units are housed in the conserved shophouses. These form the “Heritage Collection” part of 1953 Tessensohn. The other 7 shops with 40 apartments form the “Modern Collection”, housed together with the 9 “Penthouse Collection” units in the new part of the development. Oxley Amethyst purchased the land for the 1953 Tessensohn development in two parts. 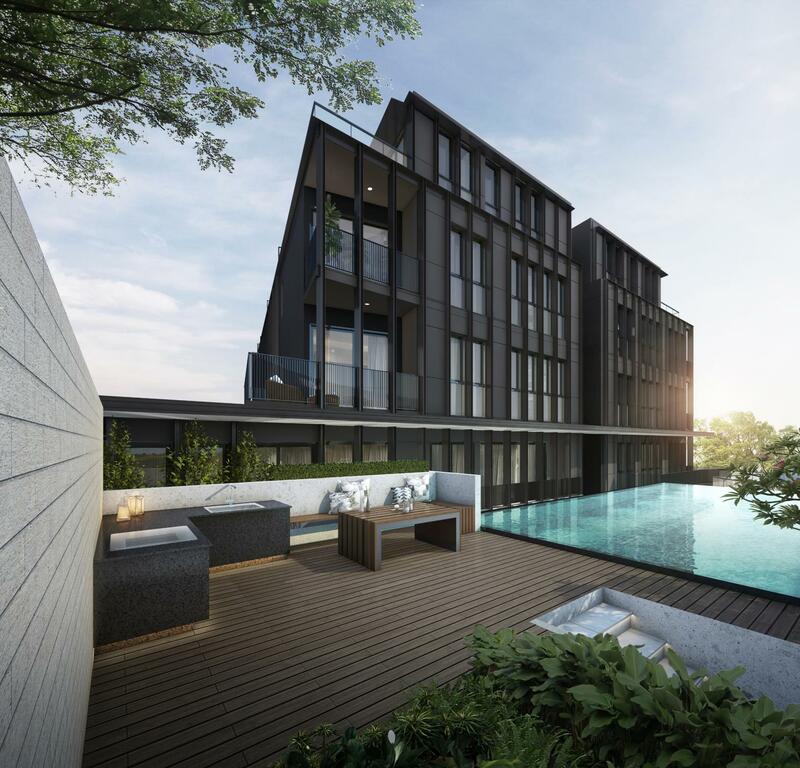 It paid SGD$14.5 million for the piece of vacant freehold land at 3 Tessensohn Road, from a private owner in November 2017. This plot is zoned residential with commercial at first floor, and spans an area of 462 square metres. 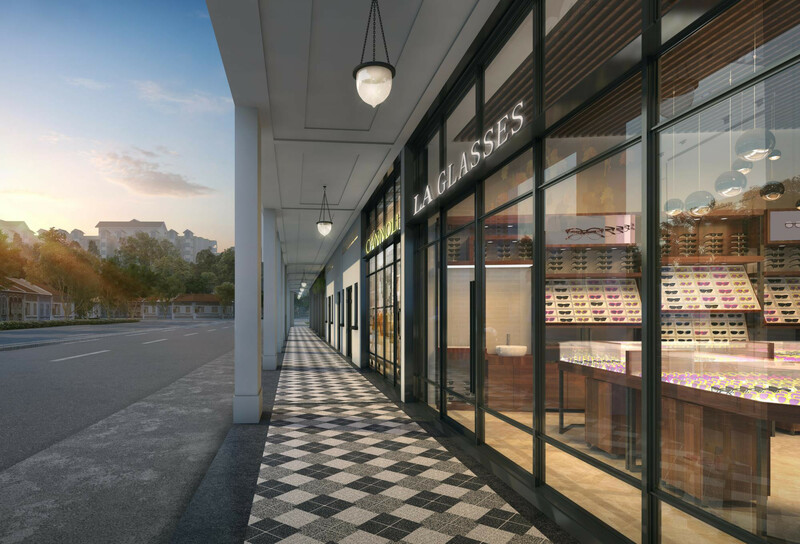 Then in December 2017, Oxley Amethyst purchased the cluster of shophouses at 1, 3, 5, 7, 9, 7A, 9A and 11 Balestier Road for SGD$38 million. These collectively span a total area of 1,118.4 square metres of freehold land. Under the URA Master Plan, these are also zoned residential with commercial on first floor, and gross plot ratio of 3.0. 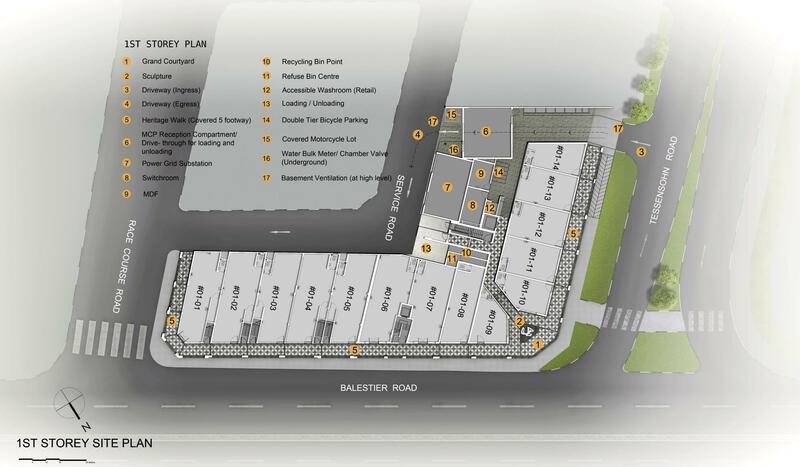 Balestier, where the 1953 mixed development is located, is a subzone within the Novena planning area. Balestier Road links Serangoon with Thomson Road. The neighbourhood is characterised by rows of shophouses, but is also home to a mix of commercial buildings and low-rise apartments. However there are budding signs of gentrification as well, which is perhaps inevitable, given its proximity to the Orchard Road area. By rights, this should be prime land, and will likely become so over time. As it is, it already enjoys strong rental demand. Which is perhaps why at the upcoming Uptown at Farrer, a new 99 year leasehold mixed development nearby, the developer has kept the bulk of the residential units, 240 of them, to be serviced apartments. They will only sell the remaining 116 apartments. The 1953 condo floor plans are available. 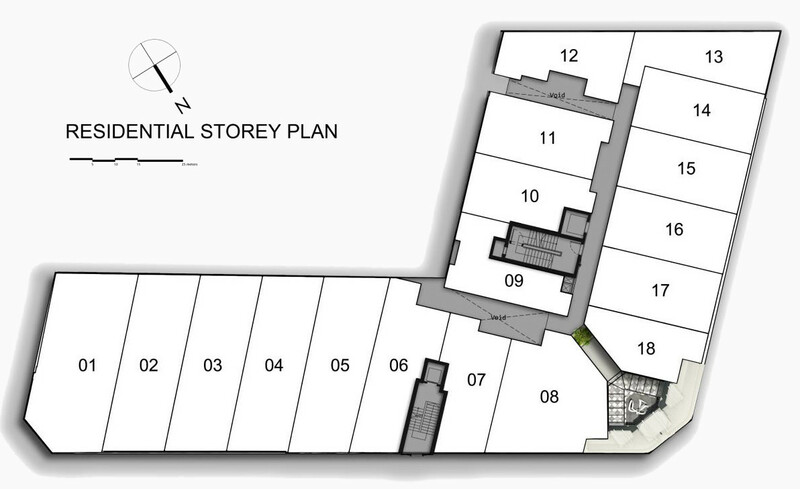 Kindly drop us your contact details through the Form below if you would like us to email you the 1953 floor plans. The 1953 showflat will be available for viewing appointments from 16 February 2019. Please let us know via the Contact Form below if you wish to view the 1953 condo showflat. Below are the indicative starting 1953 condo prices for the booking date, with the special VIP Preview discounts. Please drop us a note at the Contact Form if you wish to be kept updated on the exact prices later. 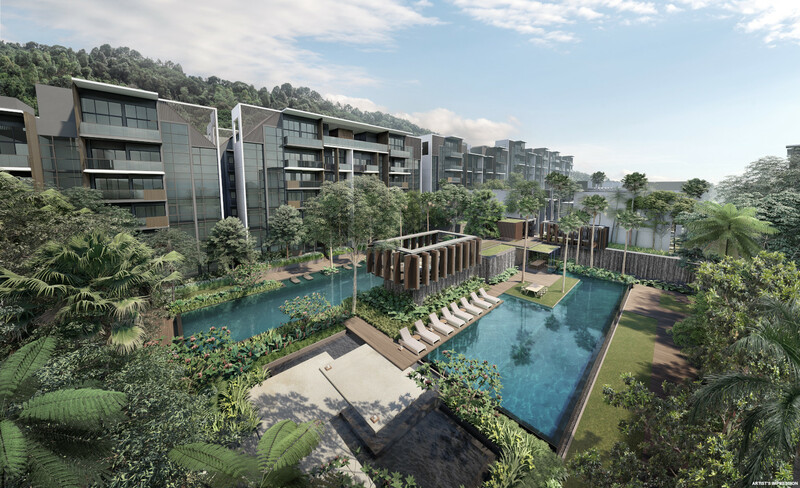 Oxley Amethyst paid close to SGD$54 million in total for the whole 1953 site spanning 17,938 square feet. Given the 3.0 plot ratio for this location, the gross floor area allowed is 53,814 square feet. On that basis, the land rate for the 1953 mixed development works out to about $1,004 per square foot per plot ratio (PSF PPR). After adding in all the development costs as well as financing, marketing and overheads, the break even to Oxley could come to around $1,700 PSF PPR. This is quite close to the break even cost for the 99 year leasehold Uptown at Farrer nearby, 6 minutes walk away. It should allow the 1953 condo a slight price advantage, given its freehold land tenure. 1953 Tessensohn Singapore is being developed by Oxley Amethyst, a fully owned subsidiary of Oxley Holdings Limited. 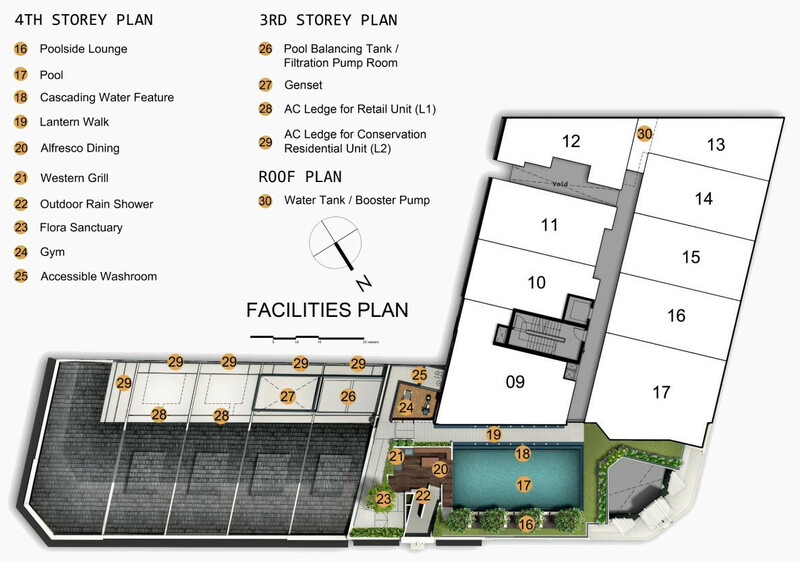 Oxley is a home-grown Singapore company that is mainly engaged in the property investment and development business. Since its inception, the Group has grown exponentially both locally and overseas, and now operates across twelve markets worldwide. They command a diversified portfolio of investment and development projects within Singapore itself, as well as in places like Malaysia, Indonesia, Japan, Australia, China, Cambodia, Vietnam, Myanmar, Cyprus, Ireland, and the United Kingdom. Their property development projects span the residential, industrial and commercial sectors. 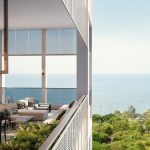 Central to the Group’s success is a focus on key elements such as prime locations, attractive design, and lifestyle features that appeal to its target market. And just as crucial is Oxley’s grasp of trends and evolving market sentiments, that has propelled its remarkable growth. 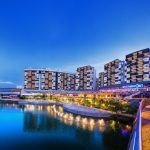 It is now one of Singapore’s most prolific developers, with market capitalisation of over SGD$2 billion at end 2018. 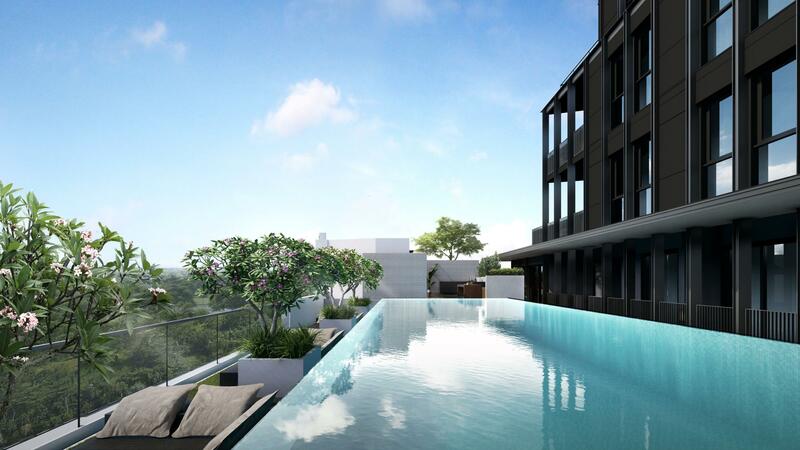 To date Oxley has completed over 8,000 homes, with another 3,800 in the pipeline in Singapore alone. In the process, it has built over 62 projects and won a number of design / development awards and accolades. As for instance, the ‘Development Of The Year (Residential)’ award in 2015 for its Royal Wharf project in London. Amongst Oxley’s many projects are local ones like Robinson Square, Devonshire Residences, Loft @ Holland, The Flow at Marine Parade, Newest, and recent launches such as Kent Ridge Hill Residences, Mayfair Gardens, Riverfront Residences, and freehold Verandah Residences (that sold out within 3 months of its debut in 2018). To spearhead its expansion, the Group has entered into strategic partnerships with other reputable developers and business partners as well. It owns a 40% share in the Pindan Group Pty Ltd, based in Western Australia, and a 15% share of United Engineers, a Singapore property development and engineering company established since 1912. 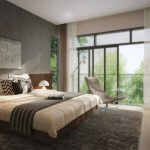 The Group has also acquired a 20% share of the Galliard (Group) Limited, a leading property development, management and hospitality group in the United Kingdom. Location. 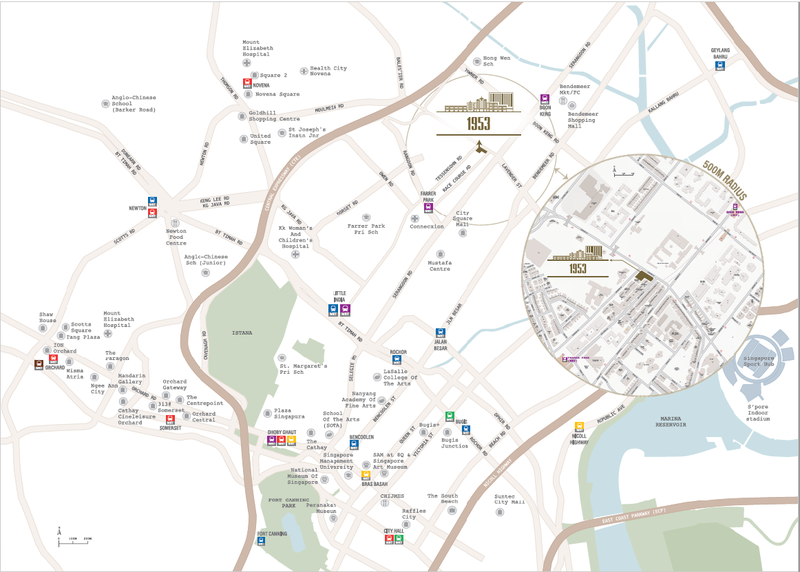 The 1953 condo location is at the fringe of the city centre, in the Balestier / Farrer Park area that is within 2 km from Orchard Road. This is an older part of Singapore in the early stages of rejuvenation and gentrification, with potential investment upside in future. Shops, Supermarkets, F&B. Around the immediate neighbourhood of the 1953 Tessensohn location are several rows of quaint shophouses, selling a variety of items. Including coffeehouses offering traditional hawker foods like the famous Bak Kut Teh and Chicken Rice, as well as newer cafes with more cosmopolitan fare. In addition, apart from the 14 shops at the 1953 mixed development itself, we have a full range of shops and supermarkets, etc, at City Square Mall and Centrium Square, that are about 8 minutes walk away. MRT Station. The nearest entrance (B) of Farrer Park MRT station on the north-east line is roughly 450 metres, or 6 minutes walk down Tessensohn or Race Course roads. This line is just a couple of stations from Doby Ghaut at Orchard Road, and goes on to Clarke Quay, Chinatown, and Outram, before ending at Harbourfront. 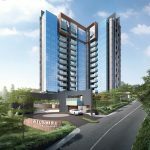 Apart from that, the 1953 condo location is also within 10 minutes walk from the Bendemeer MRT station on the Downtown Line. Medical. At the Farrer Park MRT station, directly above it we have Connexion, an integrated healthcare and hospitality complex. It combines healthcare, medical training and education, preventive medicine, as well as hospitality, under one roof. 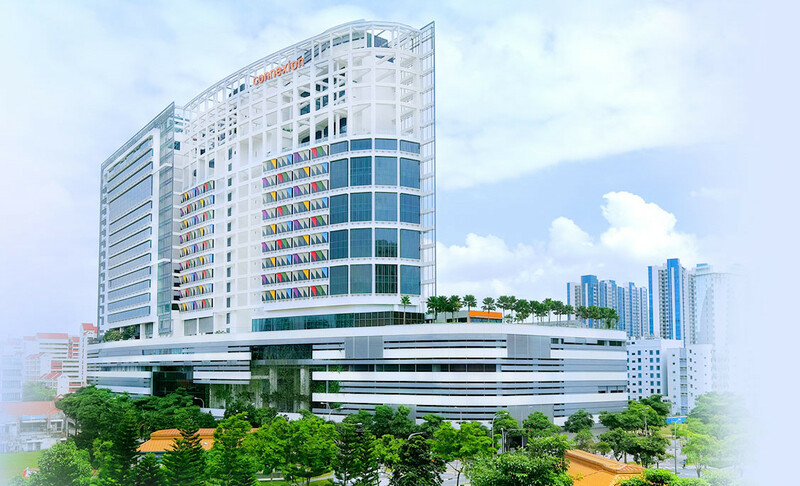 The west wing accommodates Farrer Park Medical Centre. At the 16th level is a health screening and preventive medicine centre called HealthConnexion, as well as a telemedicine centre. 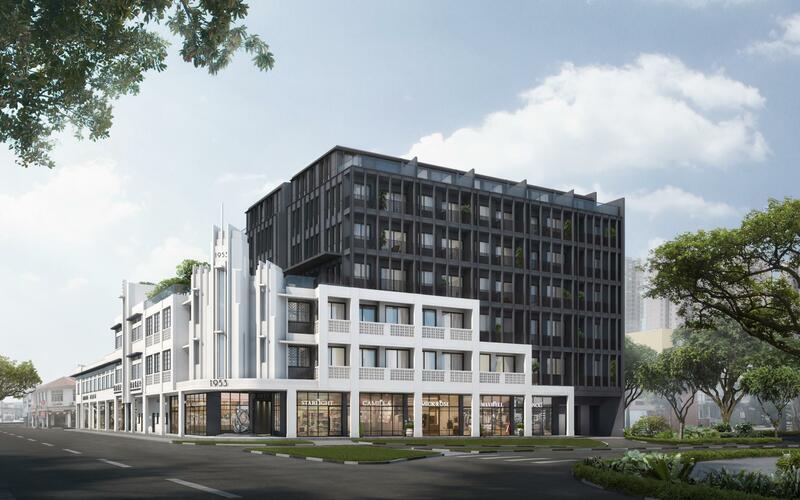 What is less obvious is that this point of Balestier Road where the 1953 condo is located, is less than 10 minutes drive to HealthCity @ Novena, an important integrated healthcare hub. This also provides a potential tenant pool of medical and related healthcare professionals. Accessibility. The 1953 location is actually very close, less than 2 minutes drive to the nearest entrance / exit of the CTE (Central Expressway) in either direction, that provides access to the expressway network island-wide. 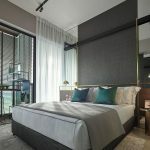 Given its central location, it is also less than 5 minutes drive (of-peak) to Orchard Road, and 10 minutes drive from the CBD and financial districts of Raffles Place and Marina Bay.